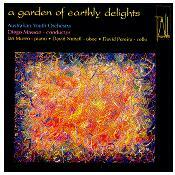 A terrific way to become acquainted with the enormous breadth of Australian orchestral music. Carl Vine tends to have two sides to his musical personality - a clean, athletic neoclassicism, and an equally clean and athletic romanticism. If either of these imply that his music is in any way backward-looking or conservative, think again. His works often contain elaborate and highly complex rhythmic constructions and orchestral writing, and have a distinctive, 21st-century character. Mind you, the Oboe concerto is among the most conservative and least interesting of his orchestral works, but is worth the listen anyway. If it whets your curiosity, I can heartily recommend any of the Symphonies, which represent the heart of his ouvre. Peter Sculthorpe's Piano Concerto is one of his simplest and starkest creations, but is no less impressive for all that. It is not a virtuoso display piece, tending to treat the piano as a sort of gamelan-like collection of sonorities. The orchestral sound is also very distinctive, with its emphasis on separate groups of strings, double reed wind instruments, heavy brass, and a large but austere-sounding percussion section. David Lumsdaine's piece, for which the disc is named, is a large-scale and elaborately structured Cello Concerto. It is somewhat more accessible than some of Lumsdaine's earlier pieces, without losing any of their complexity. The best way to describe its sound-world is to simply say that it is a wonderful musical depiction of the Heironymus Bosch painting from which it sprang. The performances are all highly committed, and the sound is excellent.